More Drawing and Painting for All! « One-day introductory course – Woven fruit bowls, lanterns and hearts! How about celebrating the return of the light by sharpening up your drawing and painting skills? This eight session course follows on from Alison Cage’s very successful Tuesday afternoon classes which we have run for a couple of years. It will suit those who would like to further their skills after taking part in her previous courses, or who are ready to get started afresh in 2018 and explore their hidden talent. This course will encourage you to take drawing into painting, but will also cater for those who wish to concentrate purely on drawing. It will be suitable for beginners, those who wish to refresh current approaches, or for more experienced artists who would simply welcome a regular, dedicated drawing or painting session. 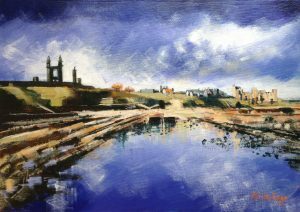 Well-known and respected local artist and teacher Alison will work with you whatever your starting point. She will introduce you to a range of materials, techniques and skills and will also show you how to practise on your own. By the end of the course you will be able to work with confidence and will have learned different approaches to mark making, investigating subject matter and expressing yourself. Cost £85, including tea and coffee and use of some materials.